Trump senior adviser Kellyanne Conway took to CNN’s State of the Union on Sunday morning to demonstrate to the American public that she truly has no grasp of the meaning of the word “magnanimous.” No inkling whatsoever. Discussing whether the President-elect would continue his ludicrous bid to prosecute Hillary Clinton for imaginary crimes, Conway revealed that her handle on English is perhaps no stronger than her tiny-fingered boss’s. Sad! “He’s been incredibly gracious and magnanimous to Secretary Clinton, at a time when, for whatever reason, her folks are saying they will join in a recount to somehow undo the 70-plus electoral votes that he beat her by,” she told host Dana Bash. Doesn’t really square, does it? She also pooh-poohed the idea of Mitt Romney’s potential appointment as Secretary of State. “He went out of his way to hurt Donald Trump,” she simpered. “We don’t know who Mitt Romney voted for.” She did, however, remind viewers of the unwelcome fact that the only person selecting Donald Trump’s appointees is Donald Trump. Chilling. Not to be facile, but Trump tried to appoint Jerry Motherfuckin’ Falwell as the Secretary of Education, reiterating once again his mission to staff his cabinet with the exhumed corpses of the literal worst people in America. He’s equally likely to appoint Mitt Romney, Rudy Giuliani or an empty cup of grape Jell-O one of his aides pulled out of the trash. Hey, I’ve heard Bobby Beausoleil isn’t doing much these days, maybe give him a call? Is it? Is it ASTOUNDING? Is THIS what’s ASTOUNDING? No. Astounding is this other tidbit from Conway’s talk with Bash, on Trump’s refusal to receive intelligence briefings. BASH: But, Kellyanne, has he turned down classified briefings? 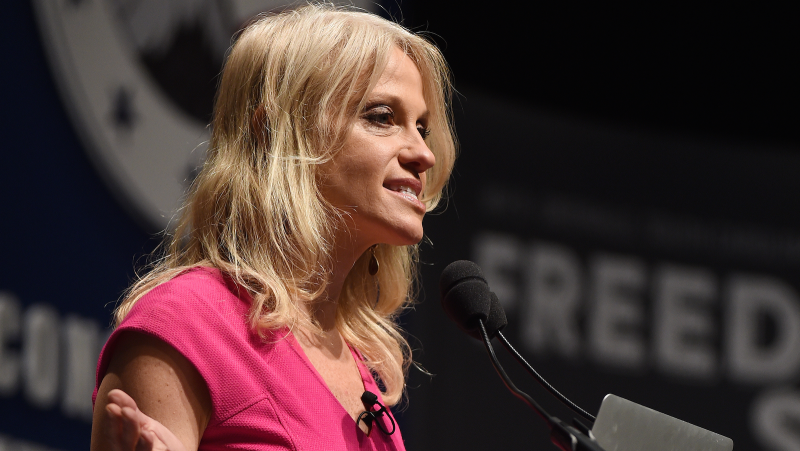 CONWAY: I really — I can’t discuss that publicly. What I can tell you is that he is the most engaged individual I’ve ever met and brilliant to boot and he is certainly availing himself of the information as provided to him from a number of sources including those intelligence briefings. We’re going to need to rewrite the entire language. The one we have has been blunted by misuse.